It is an illustration of Doctor Who‘s insanely hectic schedule that the formulation of the Series 3 Dalek serial was under way, even before shooting had completed on Series 2. Four months before BBC One was to broadcast the Daleks return in Army of Ghosts, Russell T Davies had already made the decision to set the next Dalek story in the past. 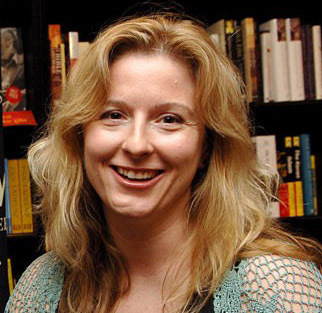 He called upon writer Steven Moffat to pen an epic new two-parter set in America, as Davies believed that parts of Cardiff could effectively double as New York. He conceived an idea to set the adventure in the depression era and have Daleks underwater in the docks. Moffat proved unavailable due to his workload and Helen Raynor was commissioned instead in March 2006, before David Tennant’s first full season had even been started. Ian Bunting’s design for the Daleks’ laboratory. When the Doctor Who Confidential team was found to be travelling to New York to conduct an interview with Raynor, a minimal crew was sent to shoot plate footage for the episode. 13th to 15th October saw work abroad completed before work commenced at Upper Boat with the shooting of the Daleks in studio. NSD3s rear panel changes. Click for a larger view. 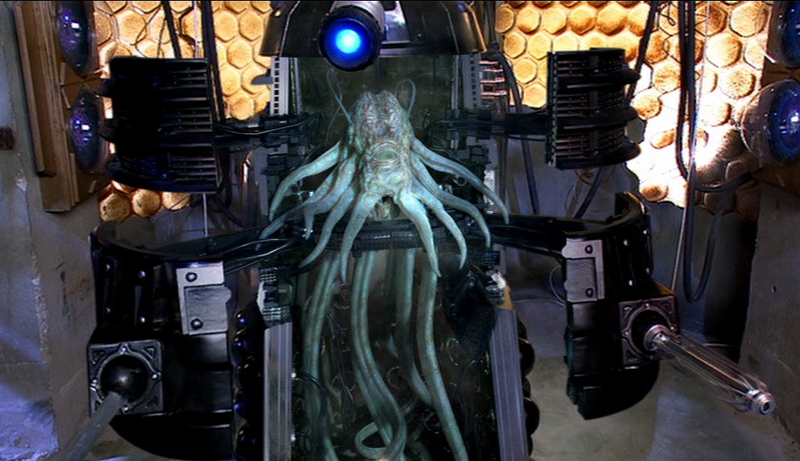 The plot of Raynor’s story continued the events from Doomsday and therefore featured ‘The Cult of Skaro’ again. With no new Daleks required, the same four Dalek props were employed. MT1 as Sec, NSD2, NSD3 and the newer NSD4. Two of the props required recalling back from loan to Upper Boat Studios. NSD2 was returned from the BBC Wales Roadshow while NSD3 had a longer trip back from the Blackpool Exhibition where it had been on display. The props remained largely as seen in their previous tale. Only one notable modification was made – and that was for the skirt of NSD3 to be altered so that it looked like the rear panels had been removed and replaced with plain metal. To achieve this look, the hemispheres were unbolted from the skirt and new surface material was stuck over the top. MT1 remained in its black livery and the Cult’s ID tags also remained, although NSD4s tag had its centre line rubbed away. The tags, again, caused some continuity errors during the tale. For example, in episode two (Evolution of the Daleks), Dalek Jast is seen at both Hooverville and watching the events at Hooverville on the screen in the Dalek laboratory. NSD2 is prepared for the opening shot. Click for a larger view. With the plate shots in the can, main filming began with the Empire State Building sets in studio on 23rd October 2006, just seven months since the Dalek props were last required. The Daleks were first on set on the 24th and the reveal of the Dalek making its entrance from the lift (or elevator) was the first shot to completed. NSD2 was the prop used on this occasion. NSD3’s (right) rear hemispheres could still be seen. Click for a larger view. Work in the sewer sets began on the 30th. With Sec only required in the laboratory scenes, NSD2 and NSD3 completed all the scenes here. NSD3 hadn’t yet had its skirt conversion by this time and its rear hemispheres can be seen briefly, causing another continuity error. For the scenes of the Daleks chasing through the sewers, NSD2 was mounted onto the camera trolley which was angled to look up at the prop. The camera was quickly pulled backwards giving the illusion the Dalek was moving very quickly. CGI Sec. Click for a larger view. With the major studio work at Upper Boat completed, the crew relocated to the old Nippon Electric Glass UK site at Triden Park for shooting of the scenes in the Daleks’ laboratory. 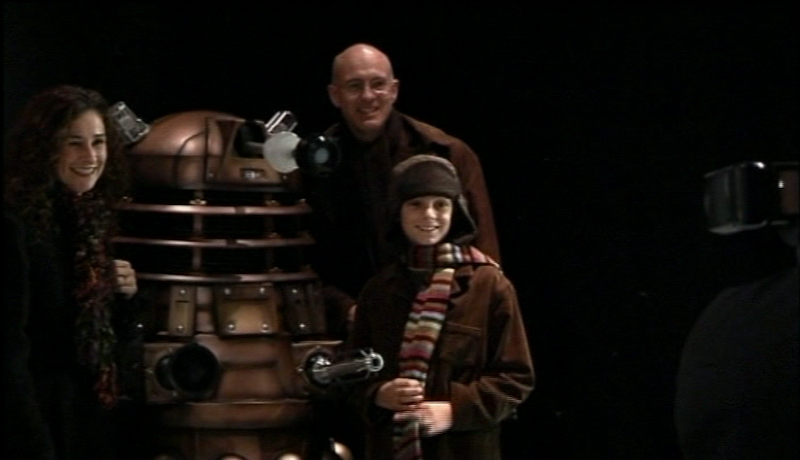 All four Dalek props were needed and so Barnaby Edwards, Nicholas Pegg, Anthony Spargo and David Hankinson all returned together at this point. 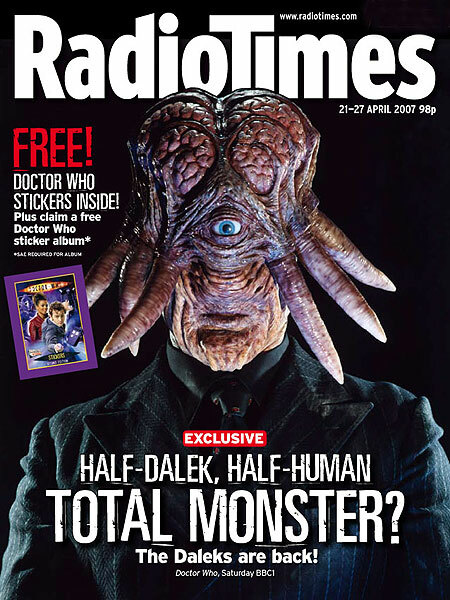 ‘Human Sec’ as featured on the Radio Times cover. Click for a larger view. As the title of episode two (Evolution of the Daleks) suggests, the Daleks were attempting to evolve and take on human traits so that they could survive. To achieve this, Dalek Sec would need to ‘join’ with a human by dragging him into his casing. 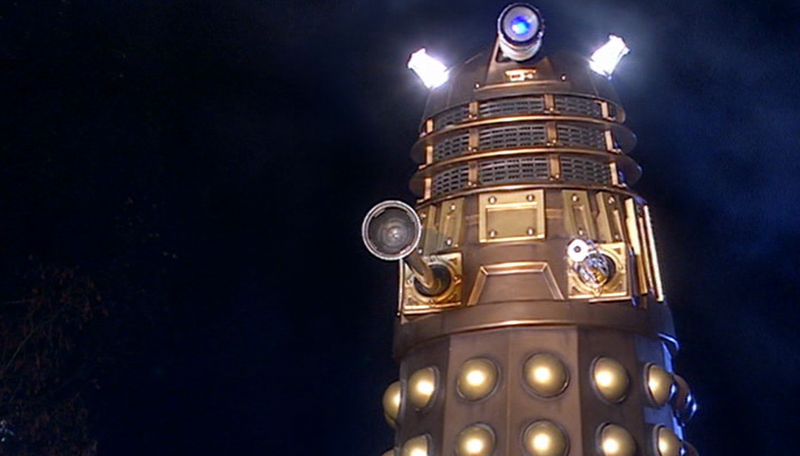 The images of Sec opening and closing were achieved in CGI and therefore no specially made Dalek prop was required. For the full transformation, actor Eric Loren, wore a full head mask complete with animatronic eye and tentacles. 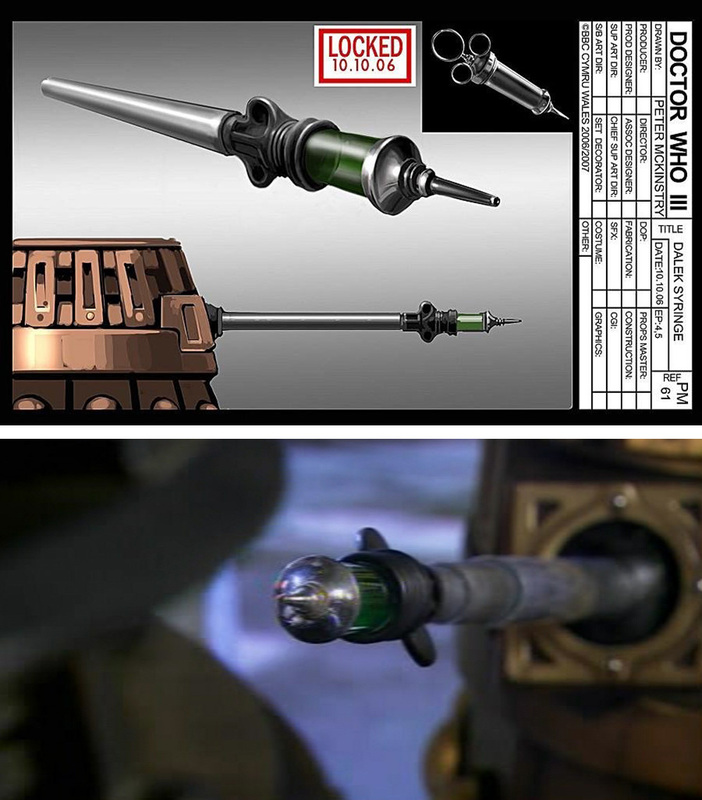 Peter McKinstry’s syringe design and how it appeared on screen. Click for a larger view. NSD3 had its rear panels adjusted at this time as the script explicitly referred to them during these scenes and the rear side of the prop would clearly be seen. A new attachment was also seen during Sec’s evolving. 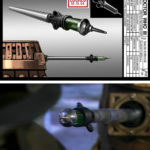 To aid the process, a solution was required to be administered by another member of The Cult and so concept artist Peter McKinstry designed a syringe-like tube that was added to the arm of NSD4. With the laboratory scenes completed, production then shifted to the park area behind Cardiff Castle on Saturday 11th November for the Hooverville scenes. Although the recorded scenes featured Daleks, no props were required at this time and the images of the Daleks attacking Hooverville were achieved by CGI and practical explosive effects. A close up of NSD3 ‘floating’ was filmed later in the schedule. The SFX Dalek ready for destruction. Click for a larger view. Recording then moved to Parc & Dare Theatre where only two Daleks would be needed. Most of the work at the Theatre involved the staging of the song and dance routine that featured in episode one, however, part of the climax of episode two also utilised the stage for filming on 17th November. NSD2 and NSD3 and the chained Hybrid Sec confronted The Doctor with the Human-Dalek army. 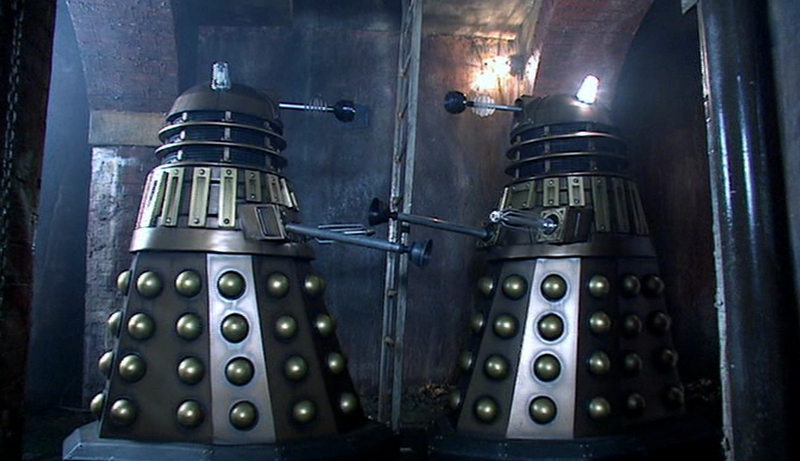 When the army turns on the Daleks, both are destroyed. Danny Hargreaves at Real SFX provided a complete SFX Dalek with pre cut-out sections to substitute for one of the Daleks. They also provided an SFX neck and dome that was mounted onto NSD3 for the second explosion. This was the final main work with the Dalek props. NSD2 on stage in Cardiff with Ben Foster. Click for a larger view. Just two days later, and by a quirky coincidence, NSD2 would be needed on a stage again. This time it was for the “Doctor Who – A Celebration” concert that was held at the Millennium Centre in Cardiff. The event was an extravaganza of music from the show and featured many of the props and monsters live on stage. David Tennant was MC for the night. NSD2 was operated by Barnaby Edwards and voiced by Nicholas Briggs who improvised throughout. 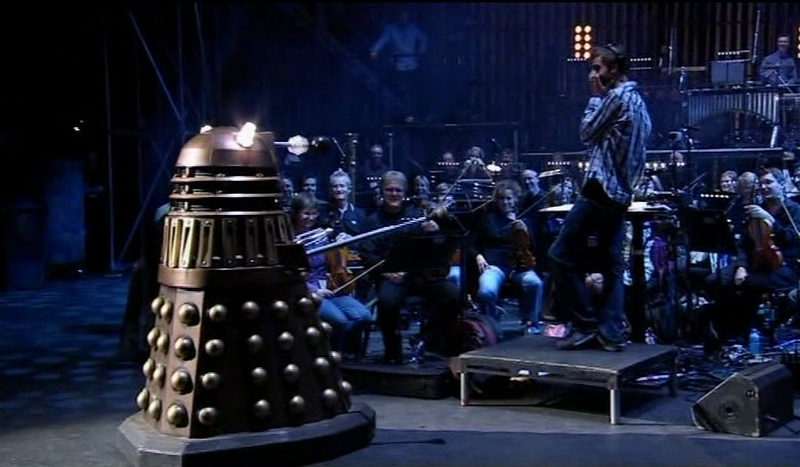 The Dalek patrolled the stage during the section featuring the music of the Dalek episodes. The concert was transmitted on the BBC in December 2006. Dalek TPE-C poses for photos. Click for a larger view. Also at the venue was another Dalek for the public to have pictures taken with. This was one of the first props manufactured by ‘This Planet Earth’ for Experience Design who handled the Doctor Who exhibitions. They arranged to have some animatronics fitted that could be activated by the public using a large red button. Doctor Who Confidential shot behind the scenes footage of the event for a separate transmission and the ‘TPE’ Dalek – Dalek TPE-C (This Planet Earth – Celebration) can be seen being carried into the venue in sections. NSD3 ‘floating’. Click for a larger view. Main shooting for the Daleks in Manhattan and Evolution of the Daleks concluded on the 23rd November – Doctor Who’s 43rd birthday. The team assembled at Cardiff Heliport where the Empire State Building’s mast set had been constructed. The brief scenes of the Dalek hovering at Hooverville were also filmed at this time and utilised NSD3. 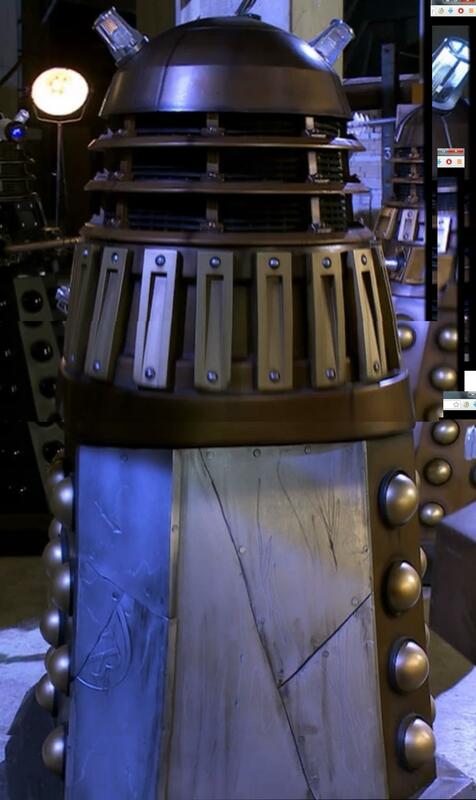 Following the wrap, the fake metal covers were removed from the panels of NSD3 and the hemispheres were re-instated, leaving a perfectly intact Dalek prop. 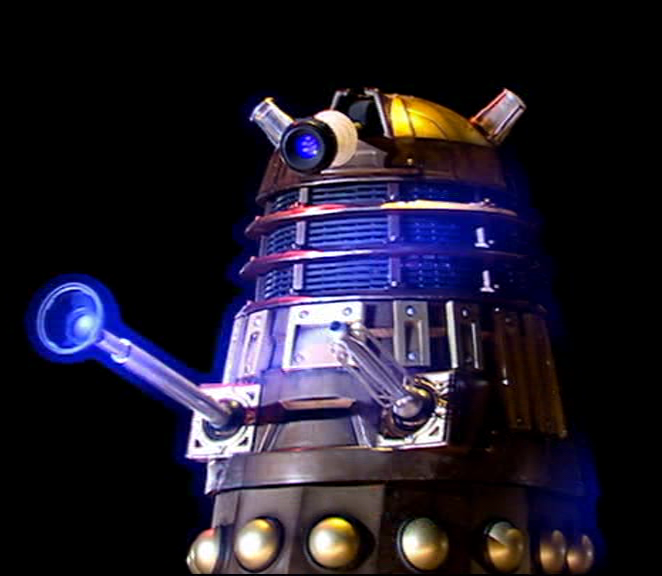 Daleks in Manhattan and Evolution of the Daleks were transmitted in April 2007 and had been recorded early in the season schedule. 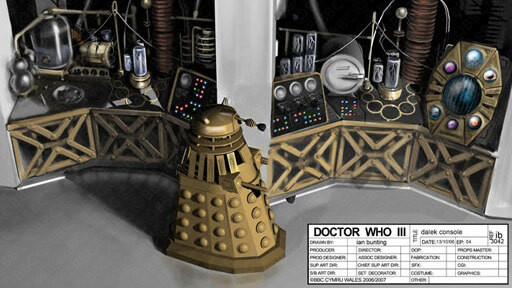 Therefore, 2007 was a quiet time for the Dalek props in studio. However, with the BBC cranking up promotion for the new series and the ongoing touring exhibitions, the props were kept busy out and about. Series 3 was launched on 21st March with an extravagant event at the Mayfair Hotel in London. Along with the stars of the show, many famous celebrities also attended including Jonathan Ross, Dawn French and Jennifer Saunders. NSD2 was was on-hand, along with the TARDIS prop, for the stars to to be pictured with. 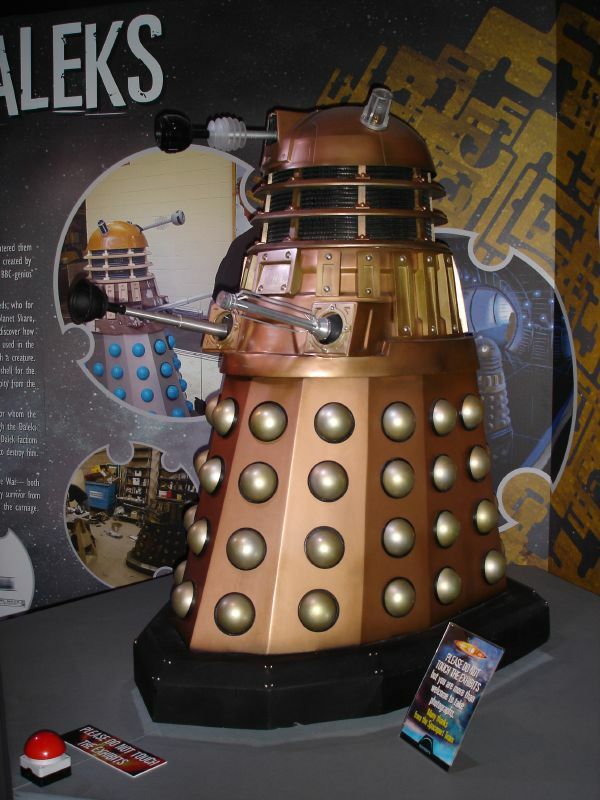 TPE supplied a Dalek Sec for the ‘Up Close’ exhibit. Click for a larger view. The exhibit at the popular Spaceport on the Wirral (see Series 2) closed in January 2007 and was moved to the Museum of Science and Industry (MOSI) in Manchester in March. Dalek NSDW was part of the collection that relocated. 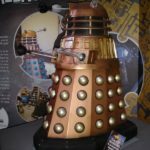 The exhibit also featured a Dalek that had been made with an open back so that the public could get in and pretend to be a Dalek – an idea that harked back to the 1980s when Dalek One-7 was cut up for the exhibition at MOMI. Back in Cardiff, the ‘Up Close’ exhibits underwent some changes in early 2007. 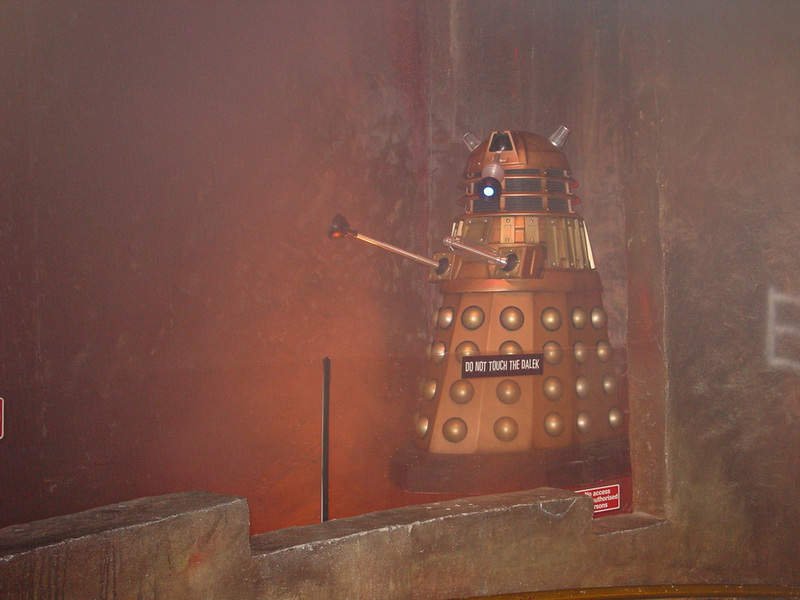 Dalek NSDB was resettled into a Doomsday set to reflect the most recent adventure last seen on screen. This Planet Earth were employed again to add a new Dalek to the exhibition. This time though it was the leader of ‘The Cult’, Dalek Sec – Dalek TPE-SEC (This Planet Earth – Sec). A brand new semi-permanent display was opened at the popular holiday destination, Lands End, in April 2007. Not only would the display serve visiting holiday makers, it was also a good base for South West based fans who struggled to travel the long distances to the other exhibitions. The exhibition, as with the other current versions, was based around the New Series. The final exhibit was a specially designed Dalek area. It featured a Dalek that rose up from behind a wall firing a laser that was fitted into its gun. It was a very impressive and immersive display that children loved. 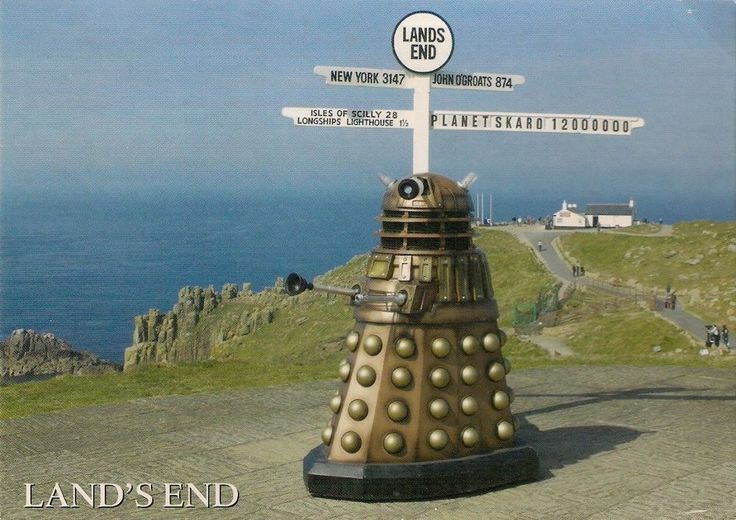 The Dalek was a modified ‘This Planet Earth’ prop – Dalek TPE-LE (This Planet Earth -Lands End). Unfortunately, for a number of weeks during the run, the Daleks’ eyestalk hung limply from the pivot before eventually being repaired. Dalek TPE-C at Lands End. Click for a larger view. 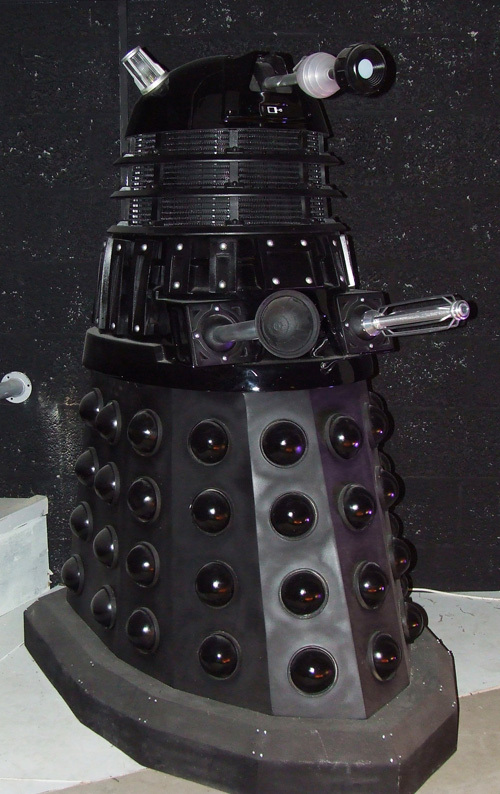 The opening day of the exhibition featured Dalek TPE-C that had first been seen at the Celebration Concert in Cardiff. It was based at the entrance of the exhibition for visitors to pose with. 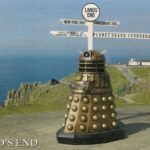 It was also photographed at the famous ‘Lands End’ signpost and featured on postcards that could be purchased later in the run. NSD3 briefly resides at BBC TVC. Picture – Jon Jacobs. Click for a larger view. 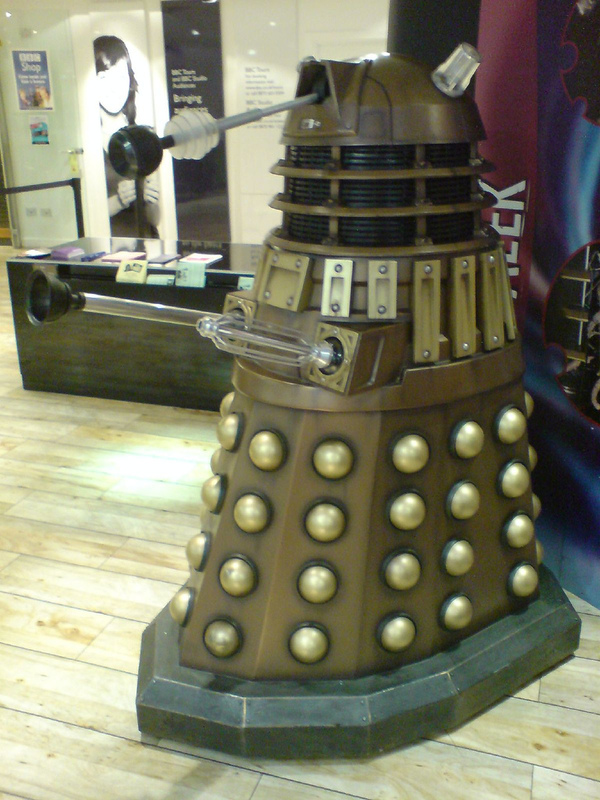 Since the concert, Dalek TPE-C had been based at BBC TV Centre where it was on display for visitors attending the studio tours. When it was required at Lands End, NSD3 briefly replaced it at TVC. It was a busy year for Dalek TPE-C. 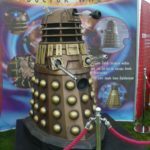 It also featured at ‘West End Live’ in Leicester Square in June then took a long trip to San Diego Comic Con in July where it was used to promote the ‘Underground Toys’ Doctor Who range. It was then back to the UK and to BBC Scotland then a short spell at the Blackpool Exhibition before ending up as part of a Christmas window display at the Hamley’s toyshop in London. NSD4 at the Kent Show. Picture – Mark Kerr. Click for a larger view. NSD4 was also kept busy when it became part of a BBC stand that travelled around various country shows during the summer period. In July, it was at the Kent Show in Detling and then at the Bakewell Show in August. Dalek TPE-TVC. Click for a larger view. To replace TPE-C and NSD3 at the TV Centre studio tour, This Planet Earth also supplied another Dalek around this time. 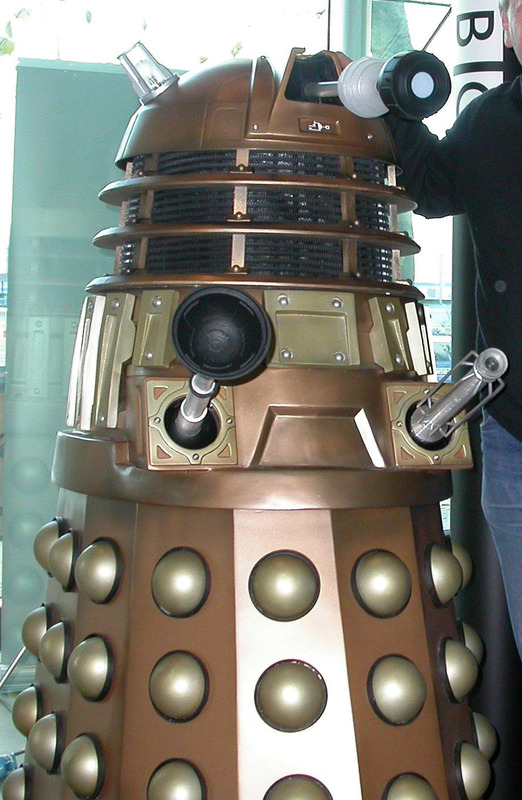 As with Dalek TPE-C, Experience Design arranged for its dome and arms to activated into motion by a separate red button and visitors to the centre were allowed to pose with the prop. We refer to this Dalek as TPE-TVC (or This Planet Earth – TV Centre). With Christmas fast approaching, the team were starting to look at promotion for the annual special. This year’s episode, Voyage of Damned, had secured the services of the incredibly popular actress turned singer – Kylie Minogue. She had risen to fame in the Australian soap Neighbours and had since carved out a singing career that had seen her gain fame all over the world. The BBC ‘promo’ Dalek stars with Kylie Minogue. Click for a larger view. With this being a rare return to acting, Doctor Who Magazine were keen to secure an exclusive interview with Minogue and set-up a special photoshoot in August to accompany the piece. The DWM team arranged with the BBC in Cardiff for a Dalek prop to be shipped to London for the shoot. 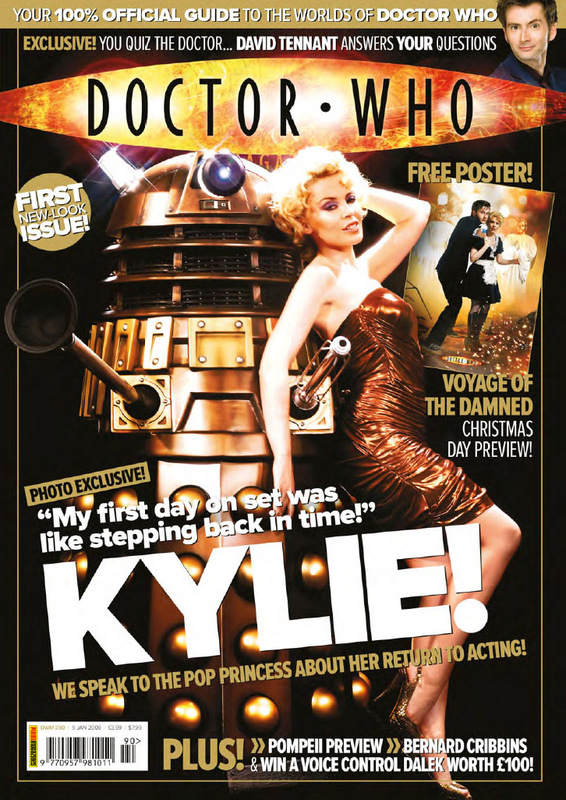 With Minogue in a gold dress, a number of pictures were taken with the star draped over the Dalek, harking back to the pictures of Katy Manning with the gold Dalek in the 70s. At first glance, it appeared as if the Dalek prop was one of the members of the Cult of Skaro. The ID badge seemed to prove as much. However, this Dalek had not been seen in Doctor Who before. The pattern of weathering was different to all existing TV Daleks and the ID badge was in pristine condition. The badge it copied could be seen partially worn away in the sections of Daleks in Manhattan and Evolution of the Daleks that were shot on location. The Dalek had actually been made for promotional use by various BBC departments. It was returned to Cardiff after the shoot but it wouldn’t be the last time it was seen. The interview and pictures were published in the January 2009 edition of Doctor Who Magazine. NSD3 at the HMV Store in Oxford Street, London. Click for a larger view. With the transmission of Series 3 concluded, promotion began on the DVD releases. 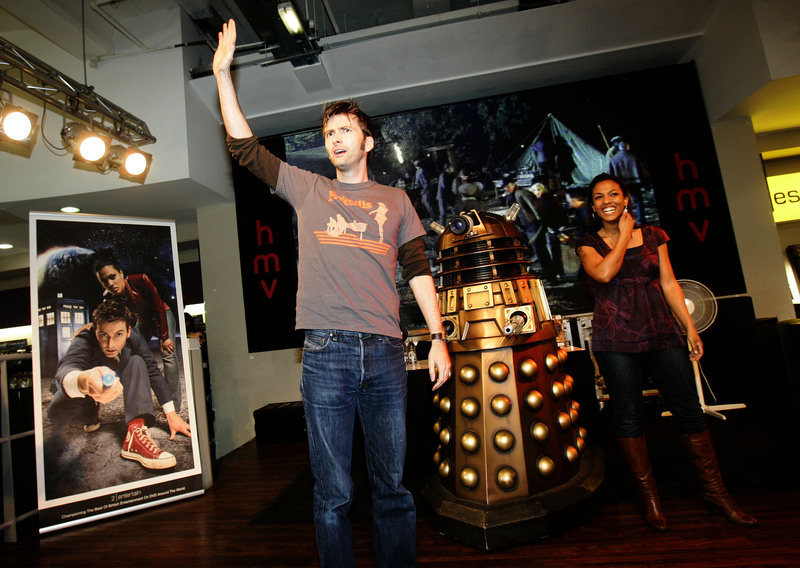 David Tennant and Freema Agyeman visited the HMV Store on Oxford Street in London in November. It wasn’t the first time that Doctor Who featured at the store for promotional opportunities. Jon Pertwee had visited in 1989 with the Supreme Dalek from Remembrance of the Daleks – Dalek N2. Tom Baker attended a signing in 1992 and Sylvester McCoy visited in 1993, again with the ‘Remembrance’ Supreme Dalek. 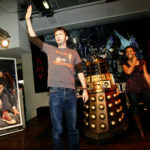 In 2007, Tennant was riding a particularly high wave of fame and crowds flocked to the famous music shop to see the star. 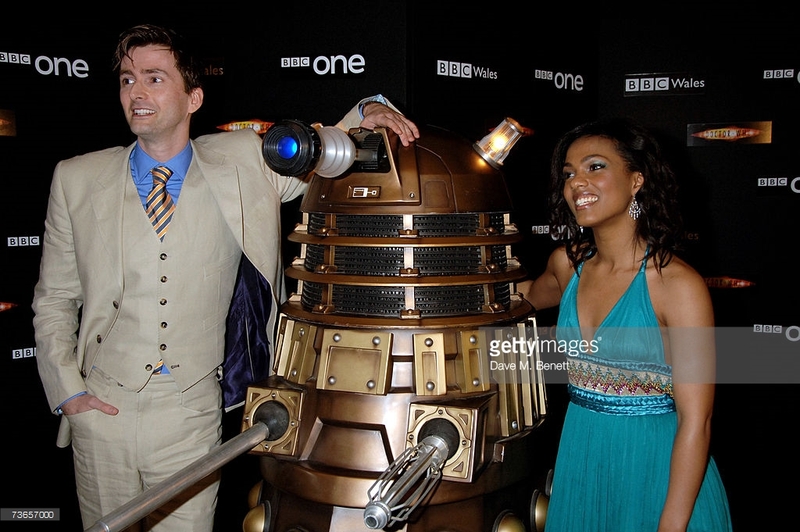 NSD3 was also sent to the store and featured in lots of promotional pictures with Tennant and Agyeman. It was then sent on to the Blackpool Doctor Who exhibition. 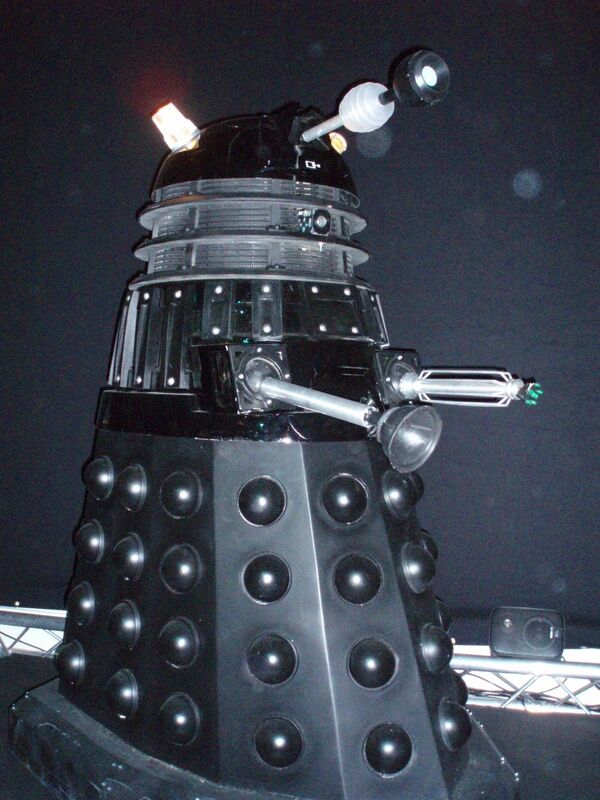 Dalek TPE-SP at the second Spaceport Exhibit. Click for a larger view. Buoyed by the success of the first exhibit, The Spaceport on the Wirral decided to house another, smaller, display of Doctor Who props from November. This Planet Earth were again called upon to supply a Dalek for the display. As with the previously supplied Daleks, Dalek TPE-C and Dalek TPE-TVC, this Dalek’s arms and dome would move on a button push. We call this Dalek TPE-SP (or This Planet Earth – SpacePort). This Dalek had received some screen-time in April when it appeared on ITVs Paul O’Grady Show. Dalek TPE-SEC2 at the National Space Centre, Leicester. Click for a larger view. Another venue keen to have Doctor Who props on display again was the National Space Centre in Leicester. As with the second Spaceport display, Experience Design organised a smaller exhibit. This Planet Earth supplied another Dalek Sec for the display. This time, Experience Design arranged for a camera to be fitted into the neck and images of visitors were relayed to a nearby screen. The images had added graphics to look as if it were the Daleks point of view as was often seen in the TV show. This Dalek will be called TPE-SEC2 (or This Planet Earth – Sec2). This Planet Earth also had their own display promoting their range of commercially available Daleks and included a bronze ‘New Series’ Dalek. 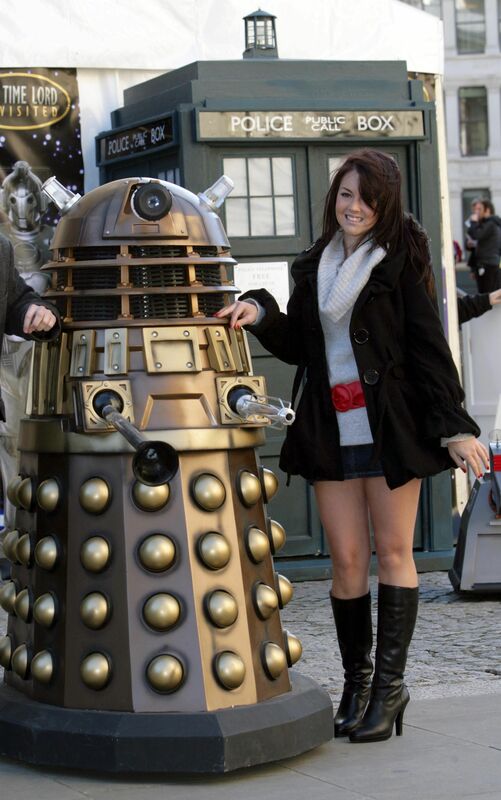 Lacey Turner with the ‘Specialist Models’ Dalek. Click for a larger view. In 1993, Doctor Who had a brush with Eastenders when a special 3D version of the show was made for Children in Need. That time, due to rights issues, a Dalek did not appear. The shows would converge again in 2008 when two of the characters of Eastenders, Bradley and Stacey, attended a Doctor Who convention near St. Paul’s Cathedral in London. 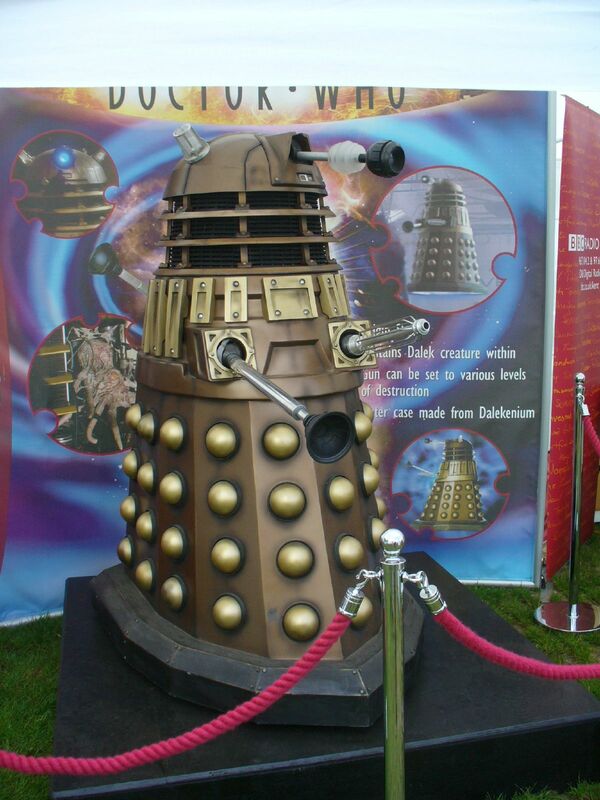 Appearing at the event was a bronze Dalek. This prop had been made by Specialist Models and had been retained by them since its manufacture. It mimicked the original MT1 Dalek from Dalek in that it featured the gold lower collar that had been removed since Parting of the Ways. As it was built for display purposes, a switch was added to the rear to activate the light in the eye. Taping took place at St. Paul’s on the 3rd and 4th December (and shown in February 2008) and stars Lacey Turner and Charlie Clements posed for the press with the Dalek. As this Dalek has it lineage from the original mould of MT1, we refer to this Dalek as NSD-S (New Series Dalek – Specialist).